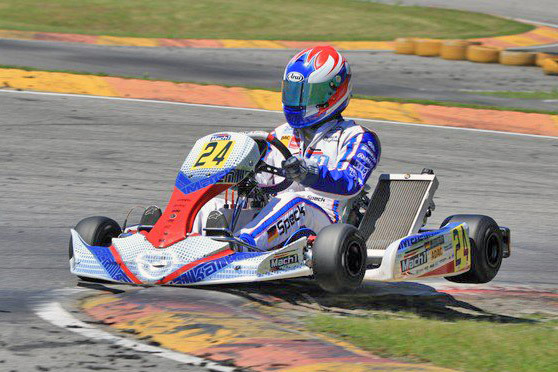 The third event of the German Kart Championship in Bavarian Ampfing was quite the affair for the Mach1 Motorsport team. During the races, the Chassis manufacturer seemed to be out of the necessary luck, only Lucas Speck provided a ray of hope by ranking fifth. “I’m looking forward to a short break”, a relieved Martin Hetschel said after the half-way race of the German Kart Championship. For the past six weeks, the team has been travelling throughGermanyand was able to celebrate a lot of successes. These unfortunately stayed away in Ampfing. With John Norris and Lucas Speck, as many as two candidates for victory started in the highest German Kart league. After the Heats, everyone was still in a good mood, John had gained 6th position, Lucas finished on 14th. During the first race, Irish John Norris had to suffer a little though; he was involved in an accident right after the start and had to prematurely give up due to a damaged chassis. Meanwhile, the race could not have gone better for Lucas Speck. In a breathtaking photo finish, he reached fifth place and was able to celebrate his first DKM-trophy. The second finale was one to forget for both drivers. Lucas Speck had a particularly bad start and fell back significantly during the course of the race. After 24 laps the duo reached the finish line on the 21st and 22nd positions respectively, even though Norris had been aiming at the top ten during halftime of the race. Another collision caused him to lose a lot of positions again though. Lisa-Christin Brunner was not able to start at all, because she had suffered a bruised rib during Friday’s free trainings and had to pass up her participation entirely. Similar events happened at the juniors. Cedric Piro drove in the front field once again and qualified as sixth driver for the first final race, after coming in fifth twice during the Heats. During the first final race he was the victim of a spectacular starting accident and had to prematurely give up the race after only a couple of meters. After a short medical examination he was allowed to start in the second finale, but had to prematurely end this too due to severe pain. Nikolina Radonjic started for Mach1 Motorsport for the first time and presented a distinct training curve. However, in the end she just barely missed qualifying for the finals by coming in 10th in the repechage. 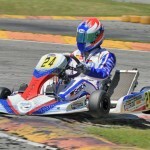 In three weeks time, the team will travel toPortugalto attend the first race of the U18 Kart-World-Championship. There, three drivers will start in a Mach1 Kart.